The Christian Association of Nigeria, prominent Catholic bishops, two Catholic groups among others have berated Kogi State Governor, Yahaya Bello, for attacking Catholic leaders who visited President Muhammadu Buhari in Aso Rock last week. Prominent groups that lambasted Bello for taunting the clerics are the Committee for the Defence of Human Rights, the Centre for Anti-Corruption and Open Leadership and the Progressives Peoples Alliance. Others, who reacted to the governor’s statement, were the Archdiocese Emeritus, Catholic Archdiocese of Ibadan, Alaba Job, and the Catholic Bishop of Sokoto Diocese, Bishop Matthew Hassan Kukah. The Catholic bishops had, during a visit to the Presidential Villa on Thursday, told the President that his goodwill had depleted by his glaring failures. 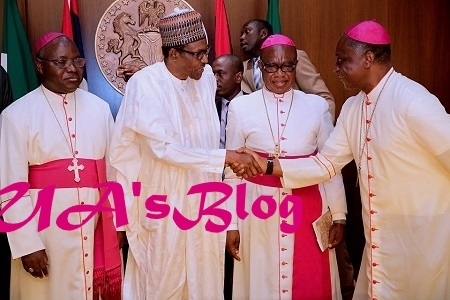 The bishops, under the aegis of Catholic Bishops Conference of Nigeria, had expressed their disappointment with the state of the nation and told the President that Nigerians were angry as a result of bad governance in the country. But Bello, in an interview with the State House correspondents on Friday, told the bishops that only those who were no more getting stolen money to pay tithes were angry with Buhari. “And of course, those who have looted the country dry and normally go to the church and mosque to pay tithe, are no longer doing so. Of course, these are the category of people that are angry,” the governor had stated. When prodded to speak further on the issue, Kukah added, “This is a character (Bello) that nobody heard anything from until he suddenly accidentally found himself in power. What does he (Bello) know about what the bishops have said? So, I don’t even want to dignify him with any response. I don’t think it’s worth giving him a story. “Frankly, people of his calibre do not deserve our response. It is also a measure of the kind of people who have strayed into power. I am not going to go into any details. It is a tragedy of what we call leadership now in Nigeria. In another reaction, the Archdiocese Emeritus, Catholic Archdiocese of Ibadan, Alaba Job, described the statement made the governor as disappointing and out of context. In an interview with PUNCH on Saturday in Ibadan on the telephone, Job advised the Kogi governor to revisit the purpose of the meeting and what the President told the bishops and compare with his statement. Job stated, “The governor will not say it if he read what we said to President Buhari at the meeting in Abuja. We told Buhari the truth about what is happening in the country. We told him about hunger, lots of atrocities being committed in the nation, lots of killings here and there and he was happy that we spoke to him. He also told us what he is doing and what he plans to do more. “I am sorry that the governor made that statement. Who are the people stealing for us? What he said is different from what we discussed with Buhari. Killings, kidnappings, and other forms of evil (practices) are around us. Boko Haram has, to some extent, been suppressed but we now have so many atrocities. “We did not discuss any issue about money to the church. It is a great pity if a governor made that statement. As far back as 1994, Catholic Church bishops constituted a prayer group that has been praying against corruption in Nigeria. Also, CAN and the CDHR, in separate interviews with PUNCH on Saturday, advised the governor to address the rot, which he had allegedly brought upon Kogi State. The media aide to CAN President, Pastor Bayo Oladeji, noted that Bello had the rights to express himself, but insisted that what the bishops told the President was the truth about the situation in the country. He added that the CAN leadership, led by Dr. Samson Ayokunle, had raised similar issues with Buhari during a visit in November last year, adding that what the President told the delegation was what he re-echoed during the Catholic Bishops’ visit. Oladeji stressed that Nigerians had not experienced so much hardship like the prevailing one under the Buhari administration, adding that Bello should keep quiet if he had nothing sensible to say. CAN explained that stakeholders had been harping on the terrible situation in the country, noting that only a few people, including Bello, were more interested in endorsing Buhari for another term in office rather than focusing on the welfare of their people. “Go to his (Bello’s) state and see what is happening there; Okene is now the headquarters of kidnapping. If the welfare of his people is not his concern, he shouldn’t force the President to follow in his steps. If he wants to become the President’s errand boy, he should resign and relocate to Abuja,” he said. Also, the National Director, Caritas Nigeria and Justice Development and Peace Commission, Rev. Fr. Evaristus Bassey, said Bello was a disgrace to the Not-too-Young-to-Run Campaign. The CN and JDPC are two agencies of the Catholic Bishops Conference of Nigeria. Bassey said, “Governor Yahaya Bello does not dignify a response. However, he is a disgrace to the Not-too-Young-to-Run Campaign. I believe Bello thinks that by freezing when President Buhari coughs, he will be spared from the wrath of God through the Kogi people who are dying each day because of unpaid salaries and misgovernance. In his own reaction, the National Chairman of the PPA, Chief Peter Ameh, in a statement on Saturday, said Bello had shown he lacked God-fearing characteristics. Ameh, who is also a Catholic, said, “Knowing the level of sacrifice it takes to become a priest in the Catholic Church, I’m really baffled by the unwarranted attack by the non-performing governor of Kogi. “It is on record that he remains the governor with the highest number of months of unpaid salaries and non performance despite the huge amount of both internal and federally-generated revenues. Also, the President, CDHR, Malachi Ugwummadu, said Bello was being more Catholic than the Pope. In a similar vein, CACOL warned that the submissions of the Catholic bishops should not be dismissed as some Nigerians were truly dissatisfied, saying Bello’s comments were opportunistic. The CACOL Director, Debo Adeniran, said, “It is true that people are angry for different reasons; although the bishops didn’t carry out any scientific study, the social media is there with so many commentaries. Meanwhile, the Senator, representing Kogi West in the National Assembly, Dino Melaye, has apologised to the Catholics and Christians in general for Bello’s alleged attack on the clerics.